There's no escape from politics, with the Democratic Unionist Party's manifesto launch spluttered all over the papers. Though there's not much chatter about what was in the manifesto, it's all about man flu and mentions in the Irish News. "Mentions of Sinn Féin: 32. Mentions of Adams: 12. Mentions of RHI: None. Questions answered afterwards: None - because she has 'man flu'." The paper's John Manley says the party appears to be lurching from one crisis to another, and its response is to be diversionary - "ladies and gentleman I give you Gerry Adams and His Radical Republican Agenda". "Arlene Foster's 'man flu' can perhaps be excused but the refusal of deputy leader Nigel Dodds or other senior party figures to take questions was unprecedented for such an occasion," he adds. The News Letter, while acknowledging that Ms Foster clearly had a sore throat, also refers to the "hugely unusual situation" that arose at the Stormont Hotel in Belfast on Monday. 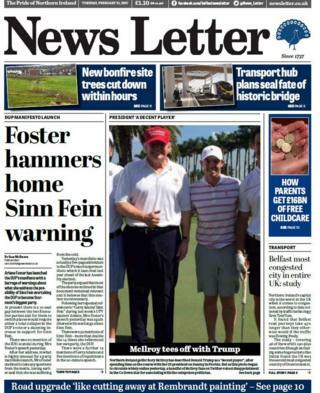 On political matters, the paper says that "beneath the myriad warnings about Sinn Féin, there were also olive branches to the only party with which the DUP can hope to form an administration in a fortnight's time." Sticking to politics, the Belfast Telegraph has a front page exclusive on what it calls the Alliance party's "plot to 'hijack' BBC Talkback". It claims the plot centres on a Facebook group, where the party's spin doctor urged members to call the BBC phone-in show with "softball" questions during a pre-election interview with Alliance leader Naomi Long. The party said the group was an informal, private forum run by activists. "We would be surprised if every other party does not have a similar outlet, where conversations of an equally candid and tongue-in-cheek manner take place. We would, however, be surprised if they were as tame". The Telegraph's Eilis O'Hanlon takes the opportunity to be a bit tongue-in-cheek herself about the expose and the "holier than thou" Alliance. "It's like seeing one of those headlines in the old News of the World about a cross-dressing vicar," she writes. "It's shocking for a moment, then you can't help but laugh." The Belfast Telegraph has another exclusive - the soaring number of children being treated for anxiety disorders across Northern Ireland. It says 50 children are being referred to specialists every week by just two health trusts. In its viewpoint, the paper says peer and exam pressure are part of the growing problem. "Added to this is the pressure from social media, including bullying, and the attitude of parents themselves who are under pressure in our increasingly competitive society." On to matters of conservation. Plans for a dual carriageway near a protected wetland are being challenged in court and the Irish News is just one of the papers to cover the case. Environmentalist Chris Murphy, who is opposed to the A6 upgrade, told the court that building the road through landscape made famous by poet Seamus Heaney would be like cutting away at a Rembrandt painting. Meanwhile, the News Letter is vexed about an historically-significant bridge which could be removed under the latest plans for Belfast's new transport hub, revealed on Monday. Billy Dickson, who is campaigning to save the Boyne Bridge in Sandy Row, parts of which date back to 1642, told the paper: "If this was an old house on Stranmillis where some well-known artist lived I have no doubt people would be up in arms." While there are plenty of stories in Tuesday's papers, there is only one picture doing the rounds. And it features a grinning US President Donald Trump with top golfer Rory McIlroy, who is more grimacing than grinning, though that might just be the sun in his eyes. After playing 18 holes in Florida, McIlroy said of his playing partner: "He probably shot around 80. He's a decent player for a guy in his 70s." Inevitably, given the level of anti-Trump feeling around the world, social media has not looked that favourably on the partnership. 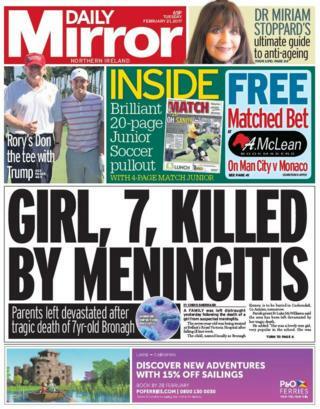 The Mirror reports that one Twitter user said: "Absolutely shameful of McIlroy. Should be stripped of his Irishness, if he still has any".